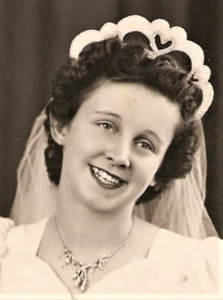 Irene I. Hainstock, age 83, went to her Lord and Savior on Wednesday, March 20, 2019 the first day of Spring. Irene was born on August 14, 1935, in Woodland township, daughter of the late Everette and Ida (Elmer) Mortimer. On January 11, 1951 she was united in marriage to Richard Hainstock. They dairy farmed many years and then moved to Baraboo, Wi where they were caretakers at the Ann Elizabeth Reese Home for 7 years. Retired in Valton. Irene was active in serving the Lord, teaching Sunday School at Valton Wesleyan church. She enjoyed gardening, canning, sewing, cake decorating, teaching ceramics and oil painting. Besides her parents, she was preceded in death by a daughter, Rhonda, brothers, Gerold, Richard and Terrance Mortimer. A “Celebration of Life” is planned for Saturday, April 27th, at the Valton Friends Church. A casual time with the family will be held from 11:00 a.m. – 1:00 p.m. A short “Reflection of Love” ceremony at 1:00 p.m. with Pastor Nate Perrin officiating, and a luncheon to follow. Roseberry’s Funeral Home assisted the family. Visit www.roseberrys.com to offer the family online condolences. I remember Irene teaching Vacation Bible School at the Wesleyan Church where I attended as a child. She was so kind . It was so easy to be around her. My mother also did ceramics at her home which she thoroughly enjoyed! So sorry for your loss. Another pillar of Valton has gone home. What a treasure this lady was in my life! When I was just a teenager, I babysat at her house and have so many wonderful memories of our times together. Then when it was time for me to get married she offered to make me a beautiful!!!!!! wedding cake and then transported it 90 miles to the wedding!!!! She has always been a cheerleader and encourager in my life. I’m sure her greatest desire is that every one in her family be ready for heaven so the circle will be unbroken. I was richly blessed to have her in my life and I pray special prayers of comfort and peace for all her family.